Most neutralization antigens are proteins but viruses can also be neutralized by antibody to host antigens, probably carbohydrate. This is present primarily in the form of glycoprotein but enveloped viruses also have cellular glycolipids. Enveloped viruses have an unknown mechanism for excluding the bulk of host protein present in the membranes from which they bud, but it cannot be excluded that small amounts of host protein, usually designated as contaminants, are an integral part of the virus particle. 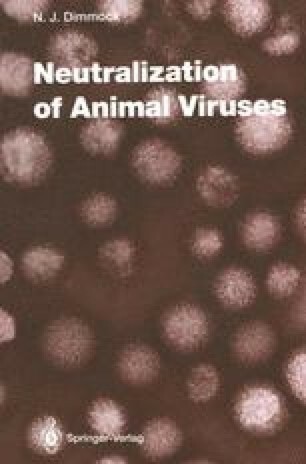 Examples of neutralizing antibodies specific for host antigens are found in influenza virus (Haukenes 1977), infectious bronchitis virus (Almeida and Waterson 1969), the lentivirus equine infectious anaemia virus (Montelaro et al. 1990) and HIV-1 (Hansen et al. 1991). However, as with anti-virus protein antibodies, binding is not necessarily synonymous with neutralization (influenza virus: Breschkin et al. 1981). Mabs in particular give precise evidence of specificity and 4 to 20 were found to have neutralizing activity to HIV-1 (Hansen et al. 1990), particularly those to mucin-type carbohydrate (Hansen et al. 1991). However, viral carbohydrate is usually not immunogenic as it is provided by the cell and antibodies would only be generated during infection if immunological tolerance were broken. It is conceivable, though, that antibodies to bacterial carbohydrate crossreact with viral carbohydrate. The same strictures apply to the lipid component of viruses. Early data on the inhibition of influenza virus with antibody to host carbohydrate have to be interpreted with care since the antibody acted not on the virus particle but on the cell (Laver and Webster 1966), possibly by inhibiting virus attachment. More recent chemical data demonstrate that six of the oligosaccharide side chains covalently bound to the HA are antigenically related to the host (Ward et al. 1981).